*Prices are indicative and depend on the current gold price and ring sizes. Shipping costs included, US and Canadian tax rates excluded. **Prices are indicative and depend on the ring sizes and the current gold price and exchange rates. Shipping costs excluded, Dutch BTW included. 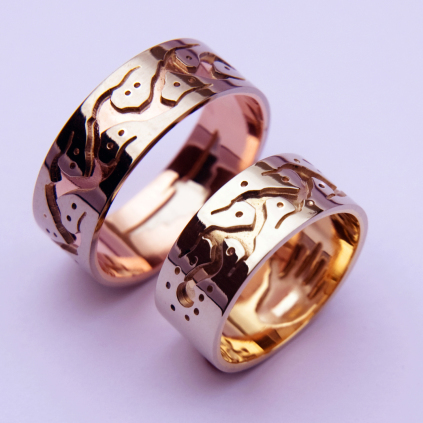 NOTE: This gold ring set can also be ordered executed in sterling silver. *Shipping costs and US and Canadian tax rates excluded. Click here to find information about shipping costs. **Shipping costs excluded, Dutch BTW included. Click here to find information about shipping costs. > Please go to our art blog to read about the symbolism of this wedding ring set.